ST. GEORGE – Dixie High’s defense continues to dominate at key moments in games. 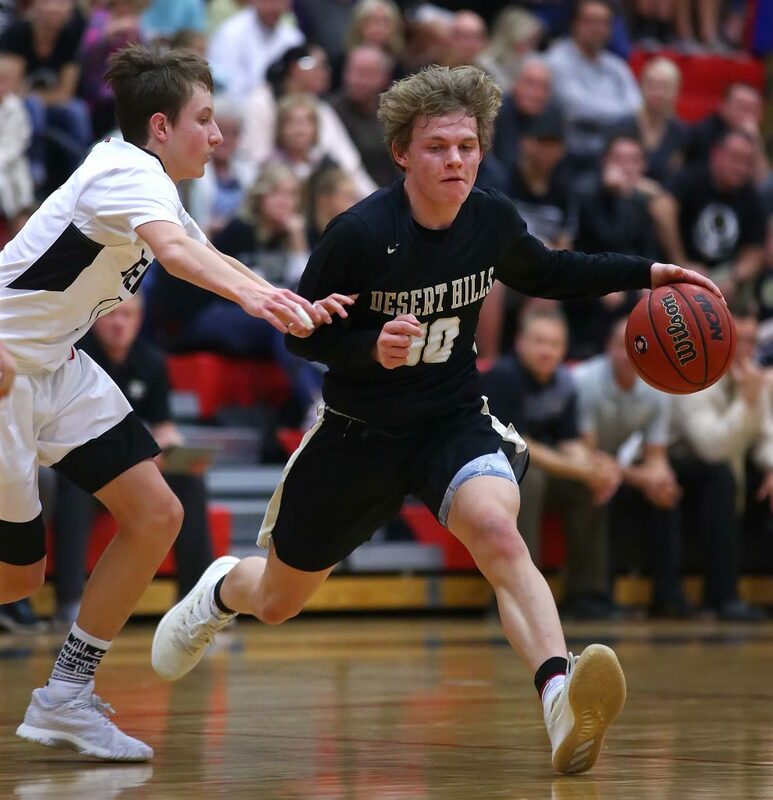 And Desert Hills’ offense is looking just as impressive. It should be quite a battle when the top two teams in Region 9 meet next Wednesday night. 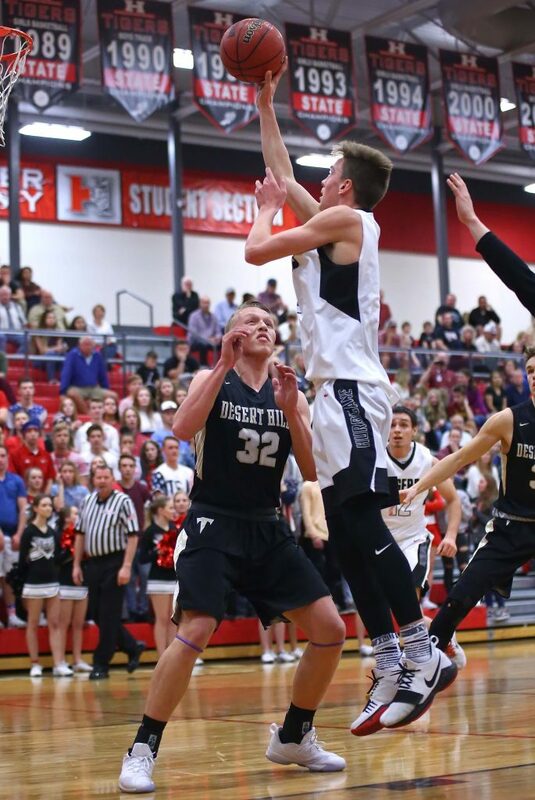 But for Dixie, which clinched at least a share of the region title with Friday night’s win at Snow Canyon, staying undefeated has been all about working together as a unit on defense. “We didn’t panic because we knew we still had a chance if we geared down and played defense,” Flyers coach Ryan Cuff said. The two teams have already clinched the top two seeds for the 2018 state playoffs and will have home games against lower-seeded teams in the first round. 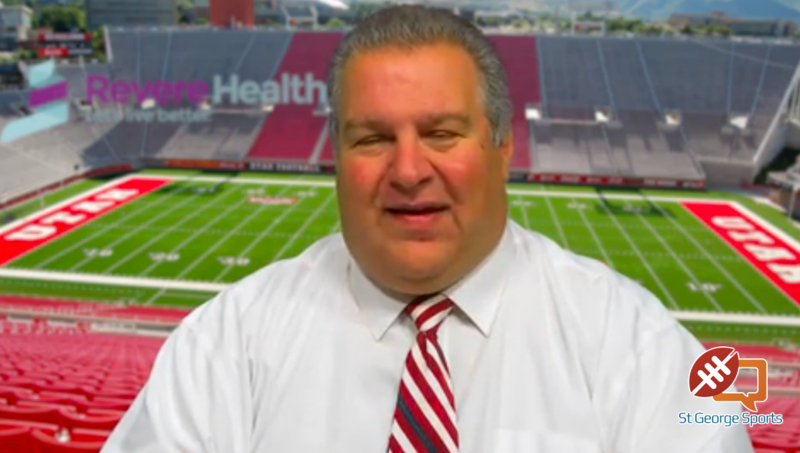 “I think we are the two best teams in the region and the cream has risen to the top,” Turley said. 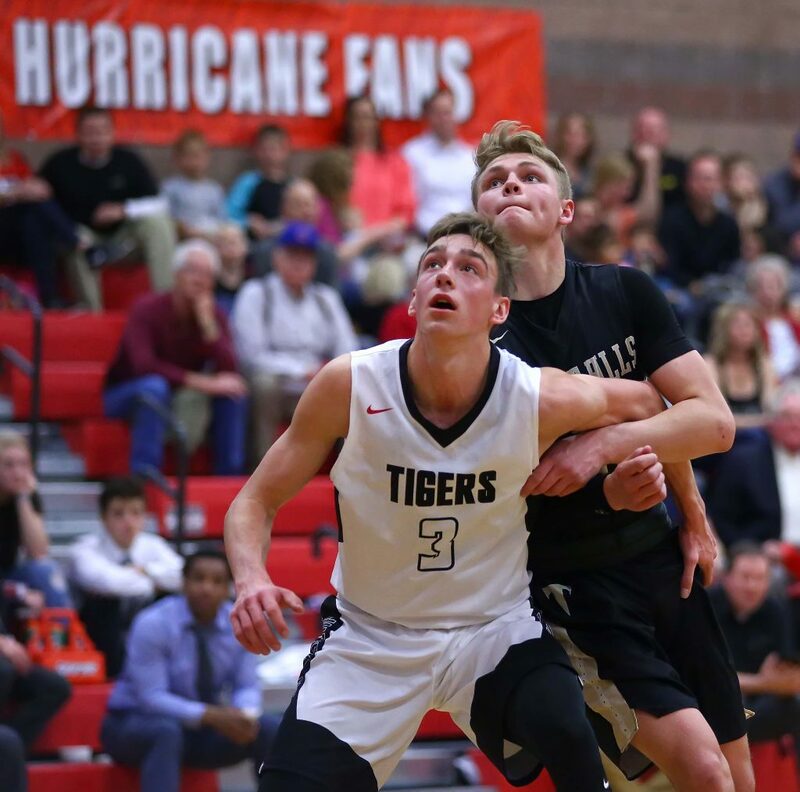 With Hurricane losing, the Tigers fall into a tie for third place with idle Canyon View. Snow Canyon’s loss puts the Warriors’ playoff hopes on life support. SC is 4-7 in region, 1 1/2 games behind both the Tigers and Falcons. If either one of those teams win again, Snow Canyon will be eliminated from playoff contention. 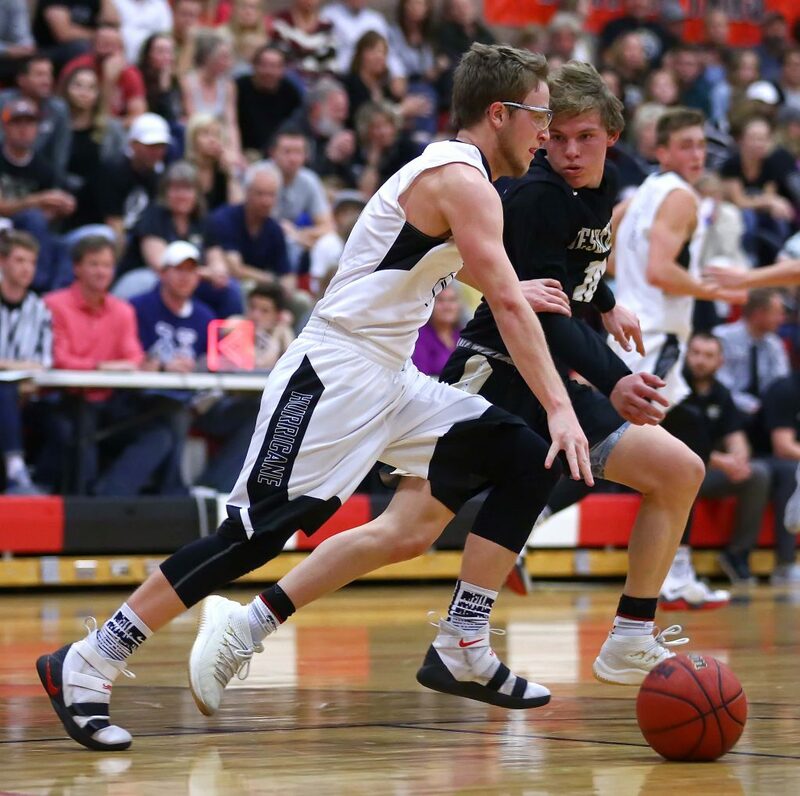 Tanner Cuff hit two big 3-pointers – converting one into a four-point play – as the Flyers rallied from eight down to start the fourth quarter and get the win. Dixie made 11 of 16 free throws in the fourth quarter alone to survive the harrowing road experience. 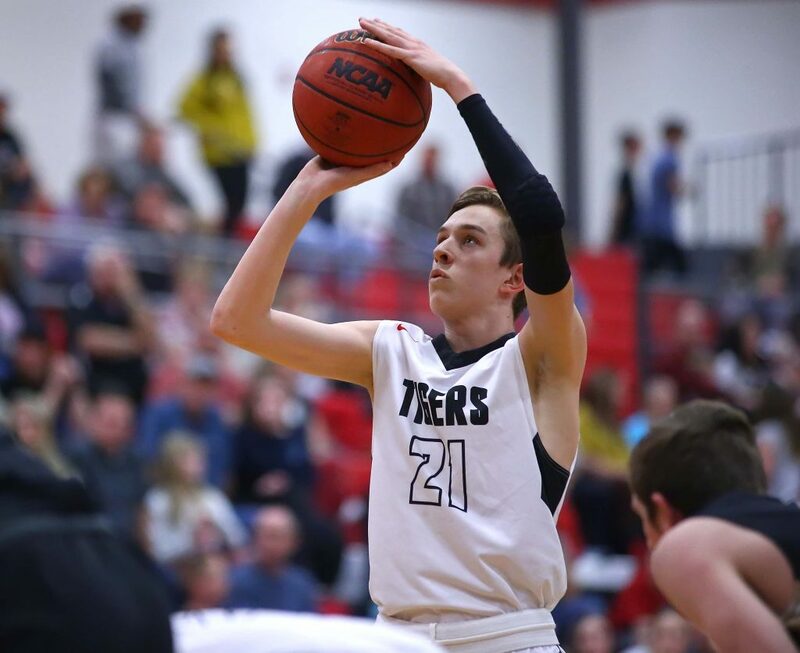 Dixie started the fourth quarter down 37-29, but a bucket by Carson Bottema and a couple of free throws by Payton Wilgar brought the Flyers within striking distance. Bryson Childs kept the Warriors on top with a basket and Braden Baker hit a free throw to make it 40-35. Snow Canyon led by five when Cuff lined up a deep ball. His shot swished through and he was fouled, converting the four-point play and cutting the Warrior lead to one point at 40-39. 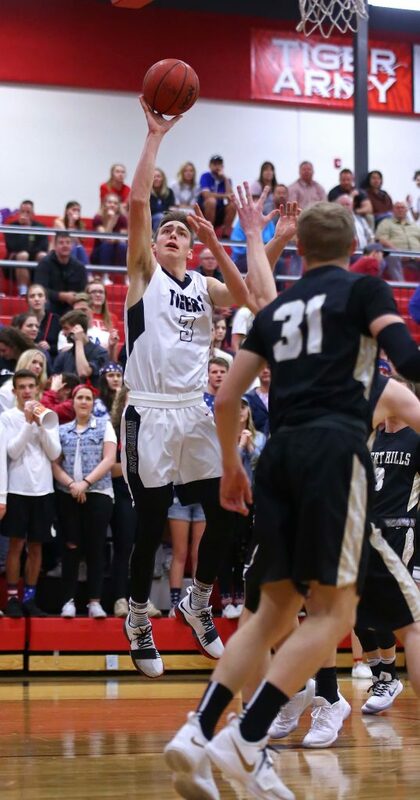 After a Snow Canyon miss, Bottema hit two freebies to give Dixie its first lead since the second quarter at 41-40. With under a minute to play, Bottema hit 1 of 2 to make it 42-40, then Bennett was fouled after a Snow Canyon miss and also made 1 of 2 to make it 43-40. Baker tried a corner 3 to try and tie the game, but it rattled out and Dixie was able to ice the game from the line in the last 40 seconds of the game. Dixie outscored Snow Canyon 23-5 in the fourth quarter. Tanner Cuff led the Flyers with 15 points, with Bottema chipping in 14. Wilgar had eight, including going 4 for 4 from the line in the fourth quarter. Dixie ended up 17 of 26 from the line (65 percent). 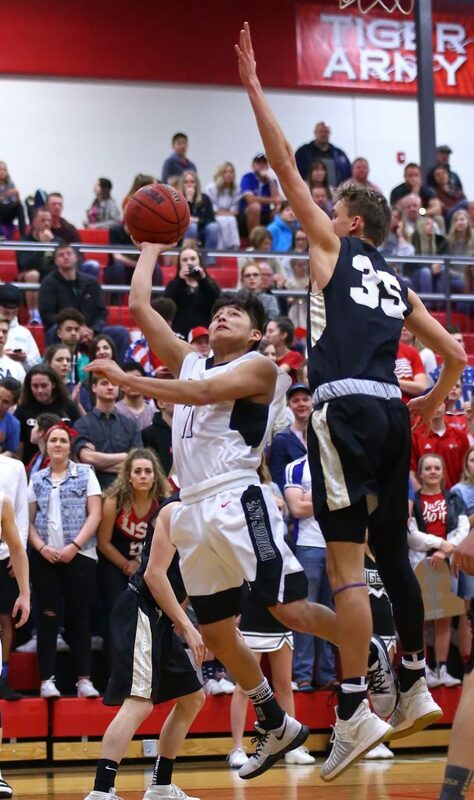 The game was tied at halftime, but Snow Canyon had a 16-8 advantage in the third quarter, with Baker and Joey Robertson combining for 11 of the 16 points. Baker finished with a team-high 14 points. Childs had 11 and Robertson added nine. 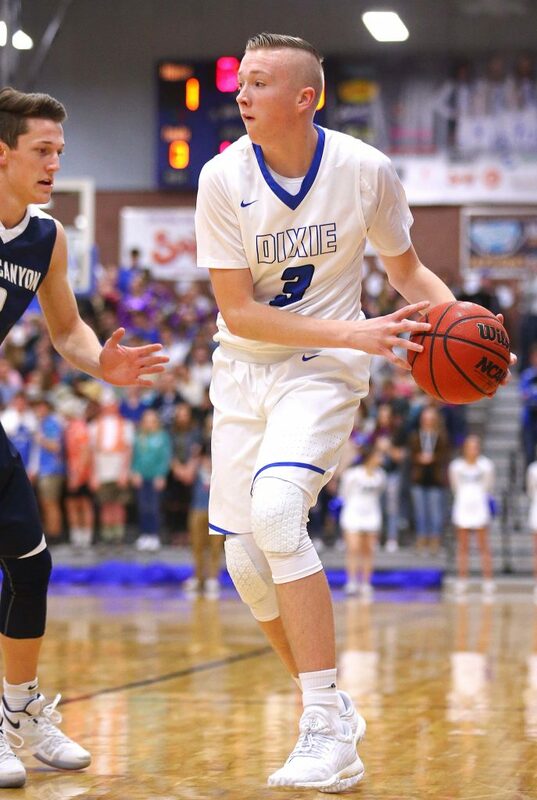 Dixie, 18-3 overall and a perfect 10-0 in region play, closes out the year with a road game against Desert Hills Wednesday and then a home date with last-place Cedar on Friday. Snow Canyon, 8-13 and 4-7, has a bye Wednesday and then closes the season next Friday with a road game at Hurricane. The Warriors need Hurricane to lose to Cedar on Wednesday (or two losses next week by Canyon View) to have a chance to get into the playoffs. 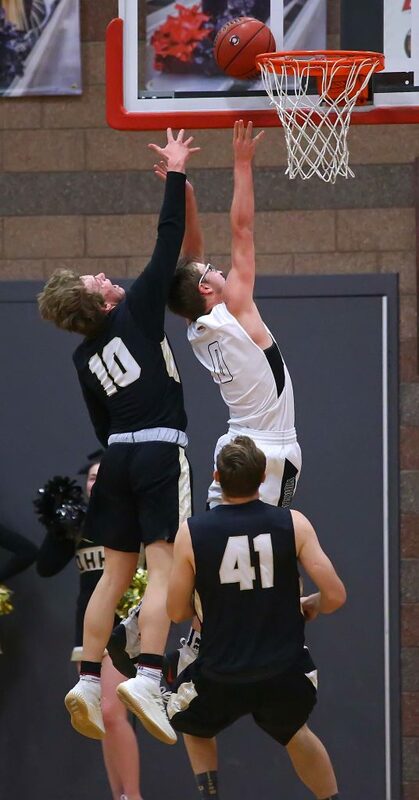 The full extent of the Desert Hills offensive firepower was on display in this one, with Tyler Webber and Tucker Peterson combining for 48 points in the Thunder’s key road win, which clinched a home playoff game for DH. The two teammates, best friends since early in their childhood, were a deadly combo for the Thunder. Webber had a career-high 25 points, making four 3-pointers and and all seven of his free throw attempts. Peterson had 23 points, three treys and 6 of 9 free throws. Peterson, who is generally the bigger scorer between the two, said he knew Webber was going to have a big night. The game was tight – and a shootout – early on. 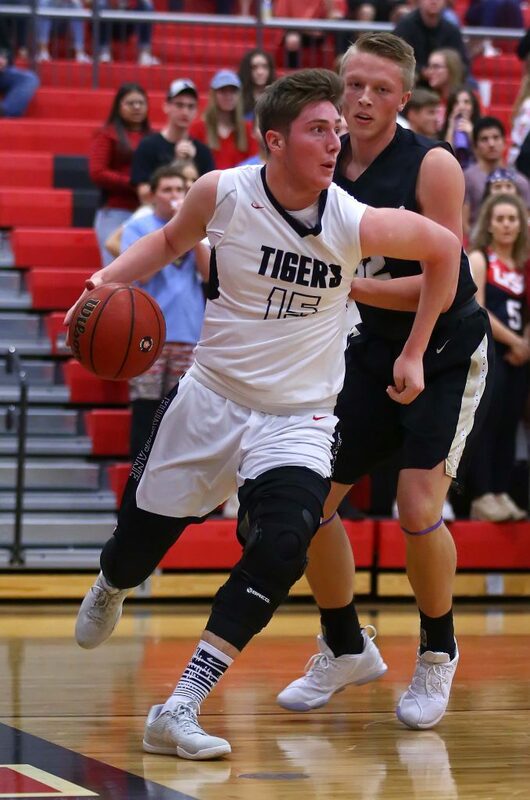 Webber and Peterson had first-quarter treys and Reagan Marshall and Jackson Last countered for the Tigers. It was a 17-16 Thunder lead after one quarter. 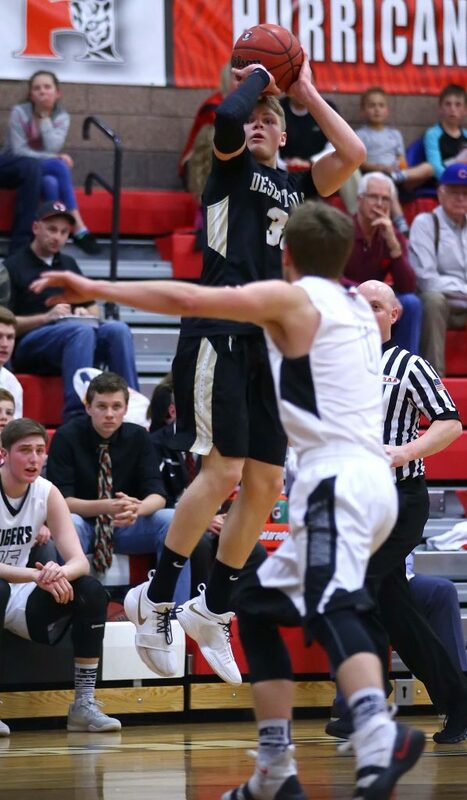 Peterson hit two treys in the second quarter as D-Hills pushed the lead a little larger at 38-35 at intermission. 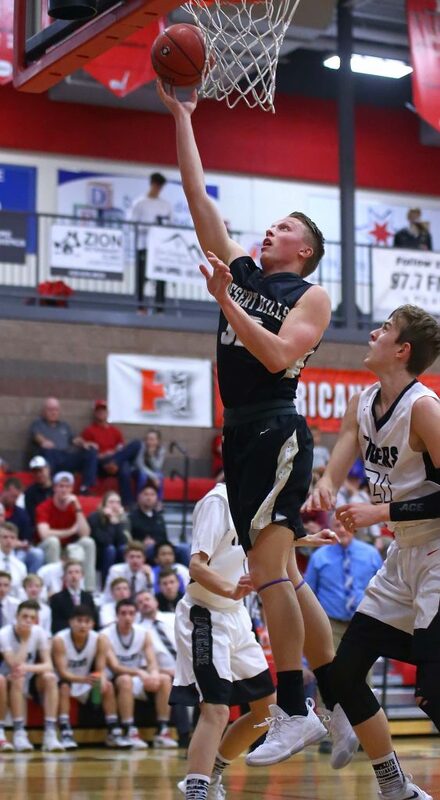 The third quarter started huge for Desert Hills as Webber had a three-point play and a 3-pointer to make it 46-39. A Peterson basket in the paint gave the Thunder their biggest lead of the game at 48-39 with 6:24 to play. DH led 50-41 when the Tigers went on a 7-0 run to tighten things up again. Marshall hit his second trey and Last made two free throws to make it 50-46. Russell Neild rattled home a runner in the lane to cut it to 50-48 with 2:55 left on the clock. It was 56-53 heading into the final period. 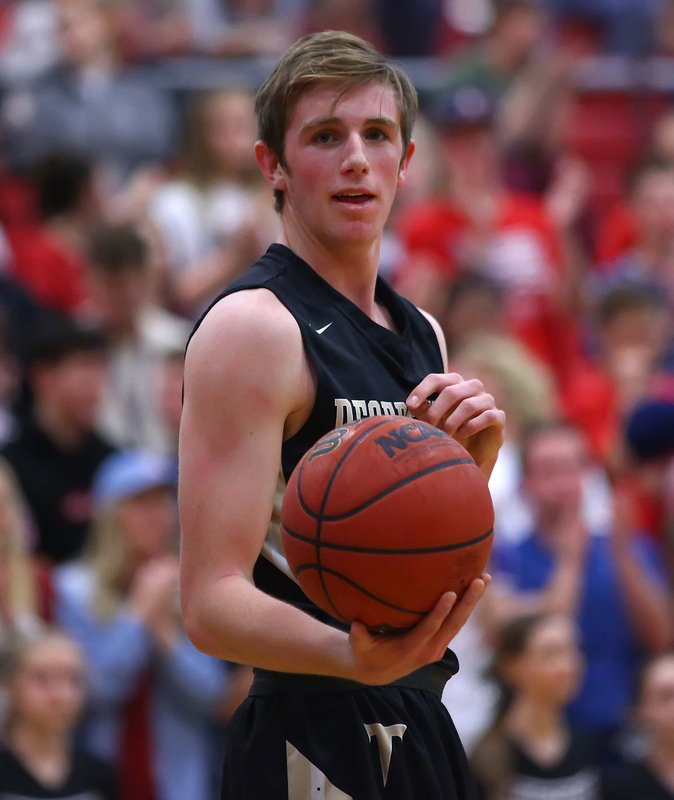 The Thunder started the fourth quarter on a 5-0 run as Peterson scored inside and Webber followed with a left-corner trey to make it 61-53 a minute into the final period. 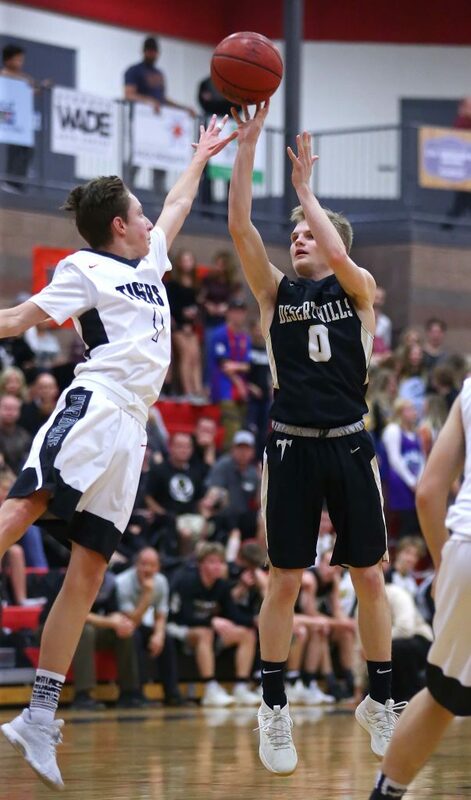 Hurricane cut it to five a couple of times, but could get no closer as Desert Hills made 10 of 12 free throws in the final two minutes to ice the game. All-totaled, the Thunder were 27 of 34 from the free throw line (79 percent). The Thunder also shot well from the floor (22 of 45, 49 percent) and from beyond the arc (8 for 16 for 50 percent). Hurricane was 20 of 47 from the floor (43 percent), but made just 5 of 19 3-pointers (23 percent). The Tigers hit 24 of 29 free throws for 83 percent. With the win, the Thunder (15-5 overall, 8-2 in region) are assured at least second place and a home playoff game in the first round of the state playoffs. 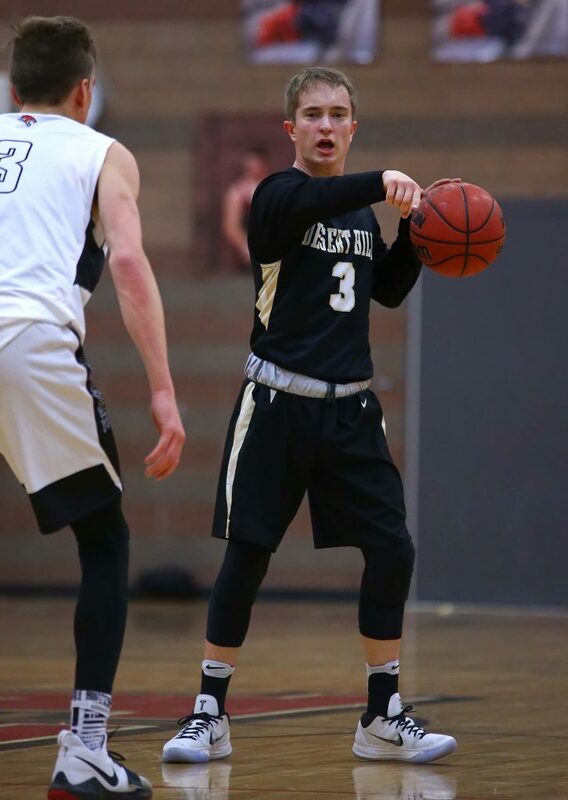 Ryan Marz had 10 points and six boards for D-Hills, which closes the year with a home game against Dixie Wednesday and a road game at Canyon View next Friday. Those are the two teams that beat the Thunder in region this year. Hurricane, which played without head coach Todd Langston (who was in the hospital after falling off a ladder and breaking some ribs), got 26 points from Last and 10 from Marshall. Last also had six rebounds, four assists and three steals. 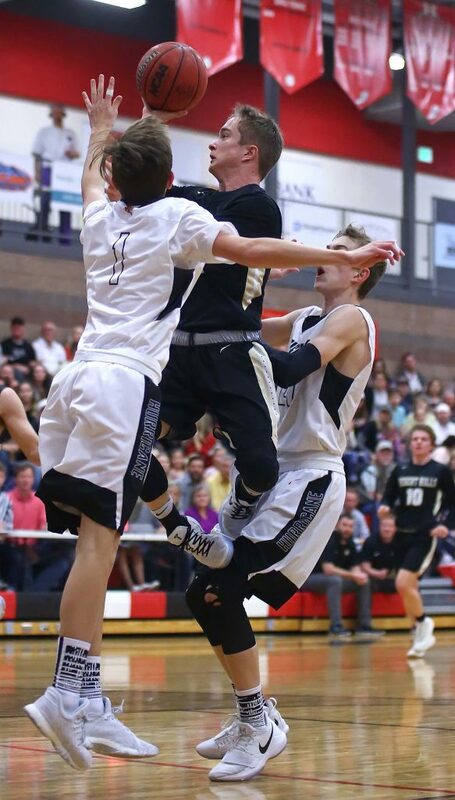 The Tigers, 11-9 and 5-5, are tied with Canyon View for third place, 1 1/2 games ahead of fifth-place Snow Canyon. 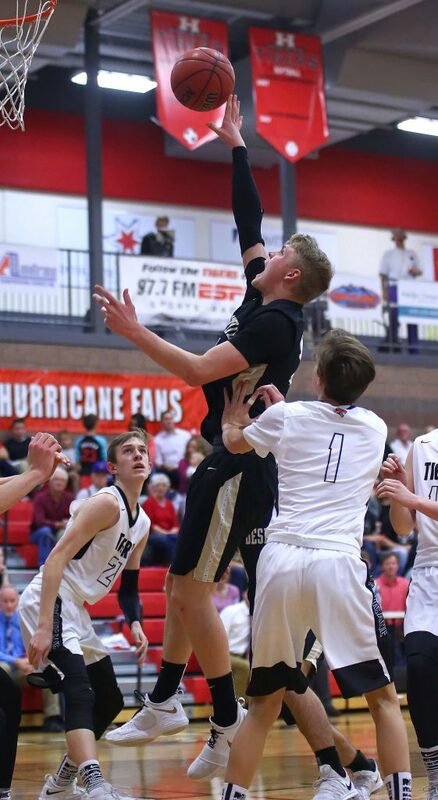 Hurricane closes the regular season at Cedar next Wednesday and at home against Snow Canyon on Friday. The Panthers snapped a five-game losing streak with the home win Friday, with Jack O’Donnell leading the way. The senior forward had 16 points as the Panthers overcame a slow start to run away with the win. 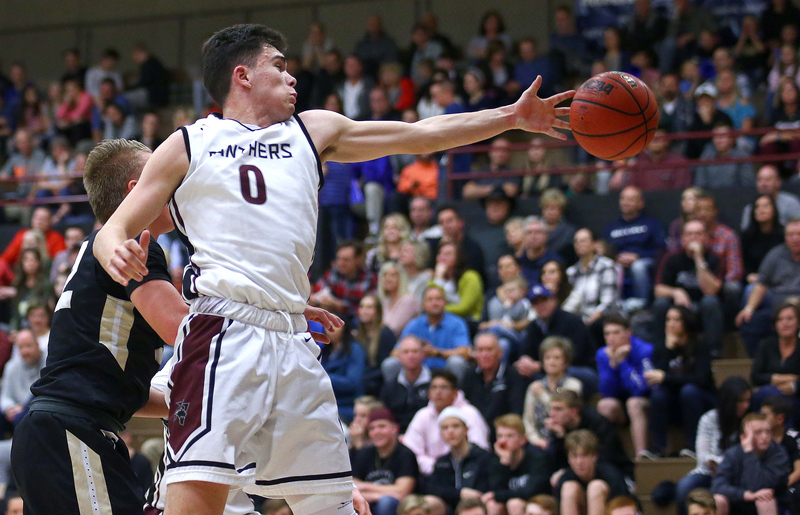 Pine View hadn’t won a game since a Jan. 17 victory over this same Cedar team. 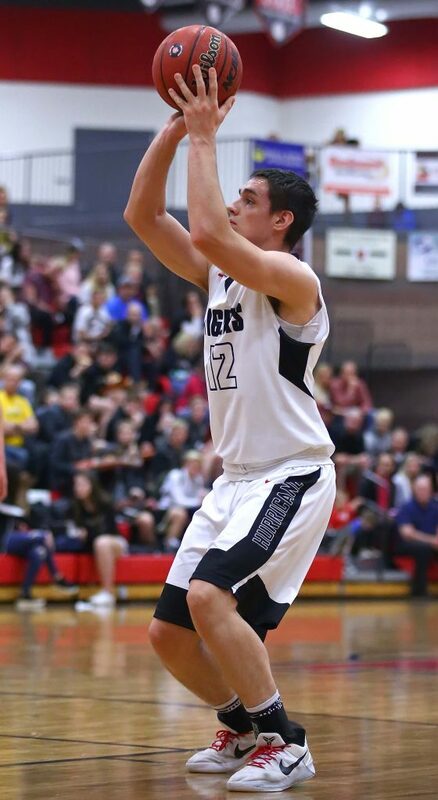 The five straight losses coincide with the sickness and injury of Pine View guard Tayler Tobler. It was a rough start for the Panthers. 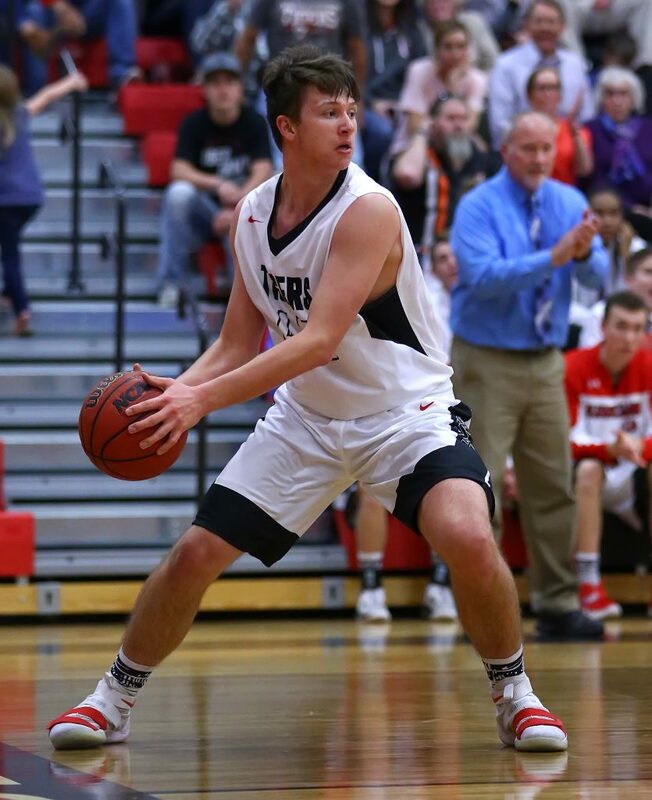 Ethan Boettcher, who leads the region in 3-point shooting, hit a deep ball as the Redmen opened the game on a 9-1 run over the first 4:52 of the game. 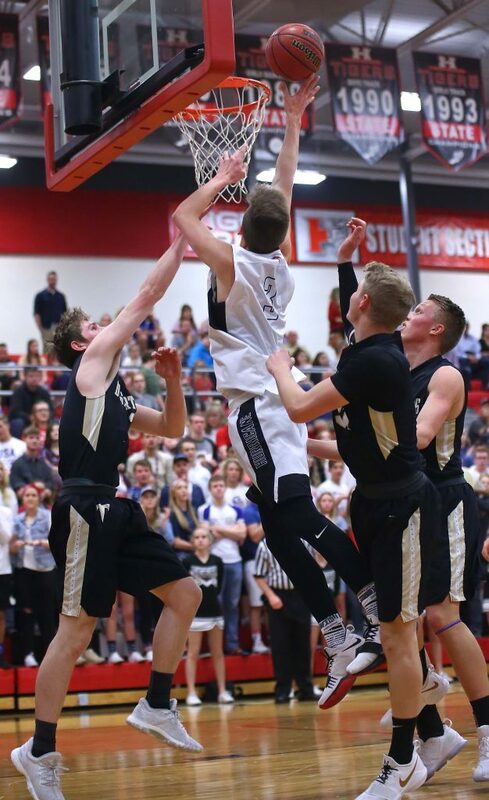 But Pine View answered by outscoring Cedar 14-3 over the final 3:08 of the first. Sophomore Jared “Suds” Sudweeks got the run started with a 3-pointer to make it 9-4. After another trey by Boettcher made it 12-4, Pine View scored 11 straight. Another sophomore, Ryan Hopper, swished a trey to make it 12-7, then Suds struck again on a deep ball to make it 12-10. Gavin Bateman tied the game with under a minute to go in the quarter, then Sudweeks hit his third trey of the period to make it 15-12 heading into the second quarter. A trey by Hunter Moore pushed the PV lead to 27-18 midway through the second quarter and the Panthers led by a 31-25 count at intermission. A couple of free throws by O’Donnell gave the Panthers their first double-digit lead at 37-27 early in the third quarter and Cedar would get no closer than six the rest of the way. Sudweeks finished with 13 points as the Panthers shot the ball well, making 18 of 32 field goals (54 percent), including 7 for 16 from deep. 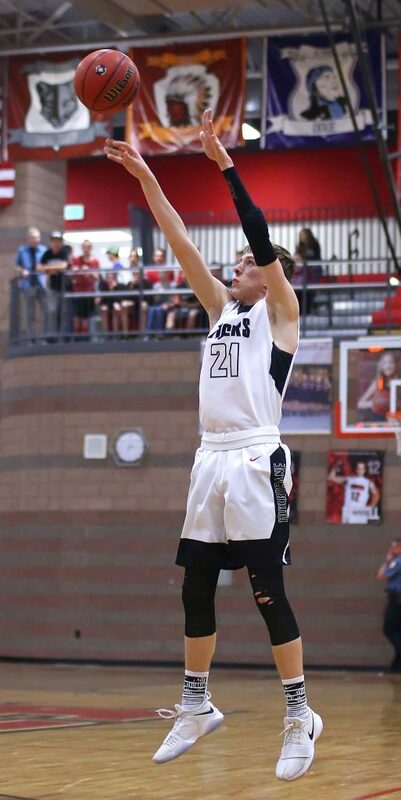 Pine View, 7-13 overall and 3-8 in region, also made 15 of 21 free throws (71 percent). 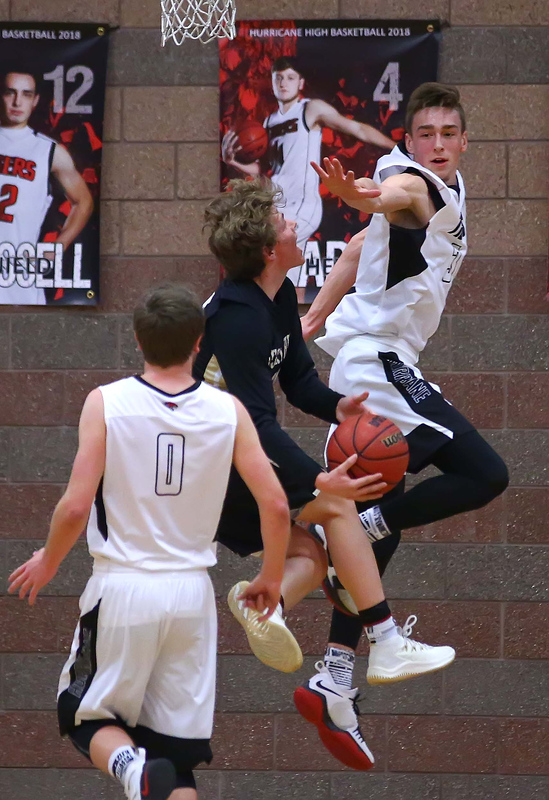 Boettcher led Cedar with 18 points and had six treys. Dallin Peterson and Dallin Grant had eight points each. Cedar dropped to 8-13 overall and 1-9 in region. 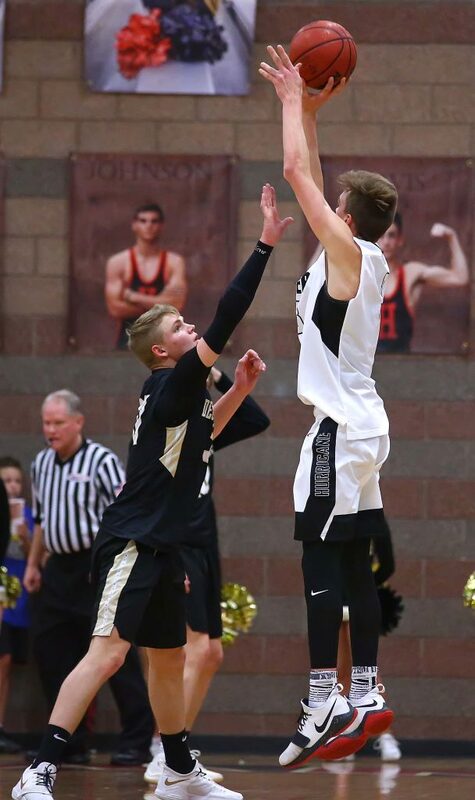 The Panthers host Canyon View in their season finale Wednesday night. The Redmen host Hurricane Wednesday and close the year Friday with a road game against first-place Dixie.